There is nothing I love to see more than accessible design. When I saw Ada Gonzales' home office on Made by Girl- I did a second take, its bold yet subtle and has all the right hints of femininity, and function! This vignette has my jaw on the floor the super beautiful pastel curtains, the white circular workspace, sheepskin chair coverings- and, obviously the bookcase- who doesn't want a ladder? 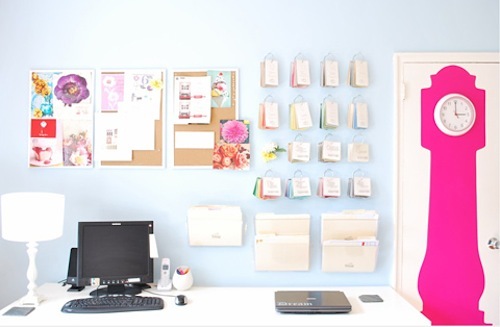 The way she uses wall space for inspiration boards is great! It gives you inspiration from past projects to draw on, and shows your clients just what you're capable of! l-o-v-i-n-g these paint swatches on the wall! mine are also on rings, and I think this is such a functional way to place them, and also add a little fun "I'm a decorator" decor! Soooo I see so many white desks in office decor. So of course I go out an buy one a few months ago to go in my home office. How the heck does everyone keep theirs so clean?! Everytime I write something on paper the ink stains a little bit and then I'm always getting knicks and scratchs. Maybe I should get a custom piece of glass cut to go over the top of it. Nice post lady! Take care! It's so beautiful! And it looks like that room gets some great light. I could totally get some good work done in that office! I love how you can tell that someone actually works in that office, unlike many of the others you come across w/ bare desks and shelves containing nothing by enamel boxes and four books. :) Thanks for posting! Love working offices too. So many creative design ideas. And there's that Pantone 2011 color again, Honeysuckle, on the clever faux grandfather clock painted on her office door! 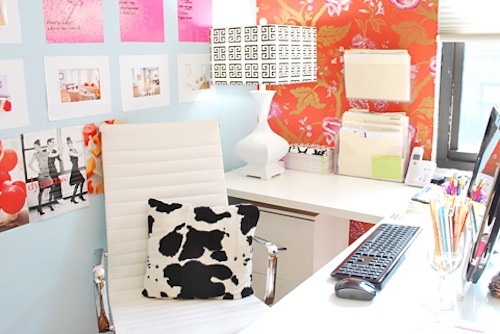 On this rainy gray day, I am wishing I had such a cheerful, bright office like this one. Thanks for sharing!